Conceptual designs of eco-friendly and long-lasting printers that would only need pencils or pens to carry out their functions. 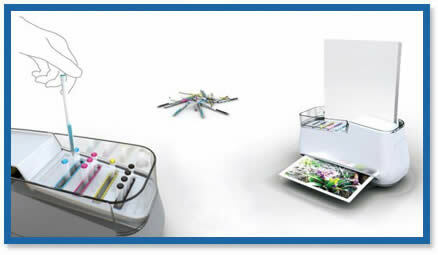 It is an “eco-friendly” printer concept that instead of using the traditional printer cartridges will use color pens that we have at home to print in a professional way. It is obviously a concept, because there would be to evaluate certain aspects, such as manufacturing costs and sale price, but the idea is basically that we can print in colors using the same pens we use to hand-letter at home. The wide spreading of the concept is in charge of Yankodesign that has published the variant hoping that the public approves it to have the chance to get investors that take it to real life. 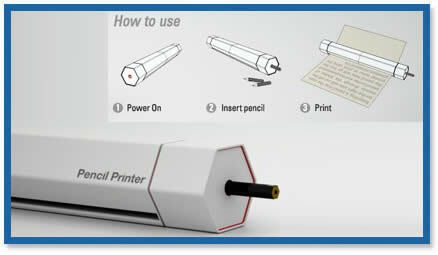 An even more eco-friendly printer that works based on any pencil we have at home, for fast black and white printings. 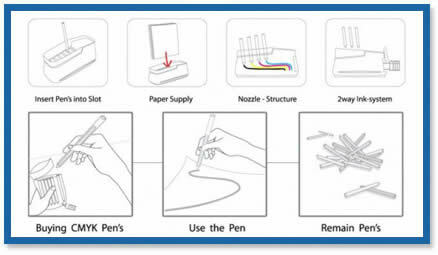 This printer would be really revolutionary in its field since it would work without any other accessory than a pencil we have at home. Imagine not having to spend money on expensive cartridges or reloads that could put our printers at risk. Another interesting detail is that it would be sharpening the pencil as necessary to work steadily until the pencil is completely worn out. It not hard to realize how much we would save with this device that apart from being eco-friendly is ultra-small and consumes minimal amounts of energy. If this do not convince us, the other good news is that the sheets can be erased and reused, since there are printed in pencil.